ITEAD Studio has a popular family of home automation devices call Sonoff with WiFi switches, smart sockets, RF to WiFi bridges and so on. All WiFi devices are based on Espressif ESP8266 or ESP8285, and while the company provide a stock firmware working with eWelink app, at least two communities have formed around Sonoff and other similar devices providing two open source firmware alternatives: ESPurna and Sonoff-Tasmota. 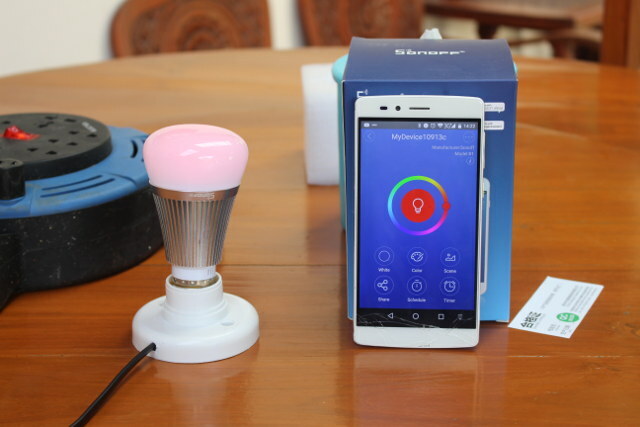 The company has sent me Sonoff B1 smart RGB light bulb for review. 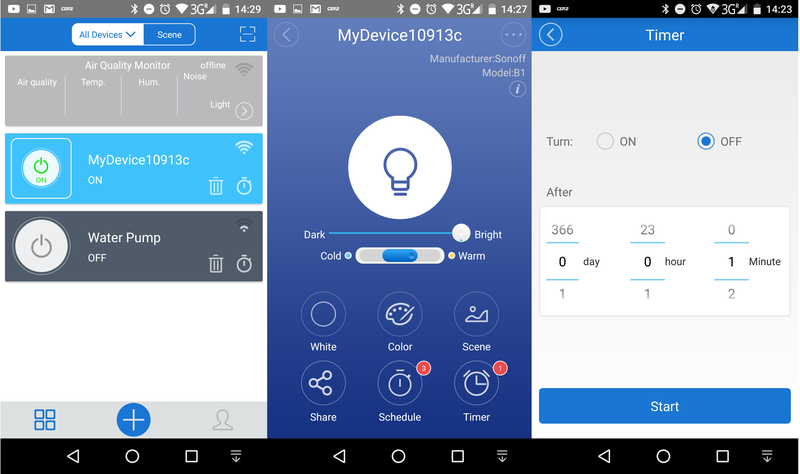 Today, I’ll check out the light with eWelink app for Android, and do a teardown, before trying one of the open source firmware in the second part of the review. 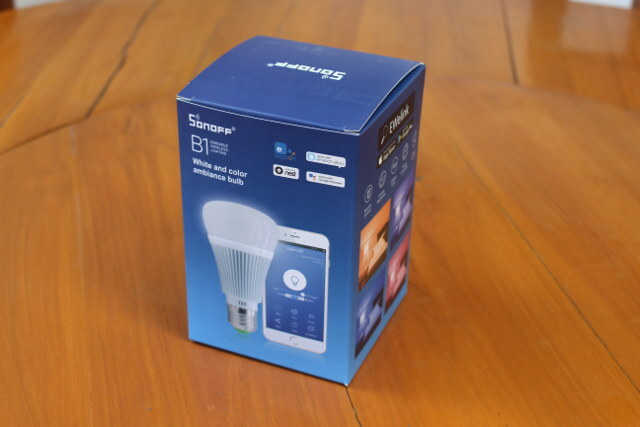 Some Chinese products come in a blank cardboard boxes, but Sonoff’s light bulb comes with in a nice looking retail package that would look good on store’s shelves. 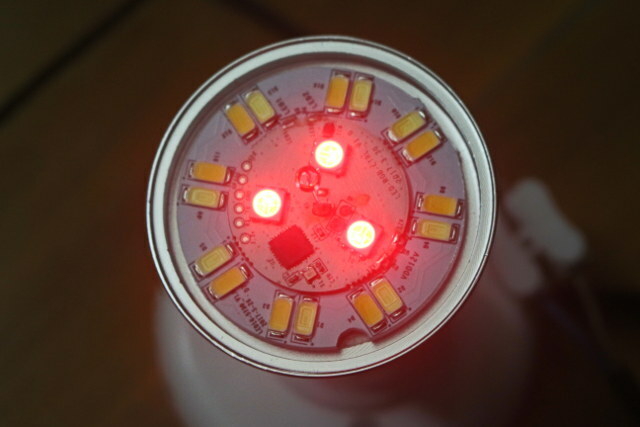 One of the side lists the specifications with an E27 base, 6W LED, WiFi support etc,, and a quick setup guide. 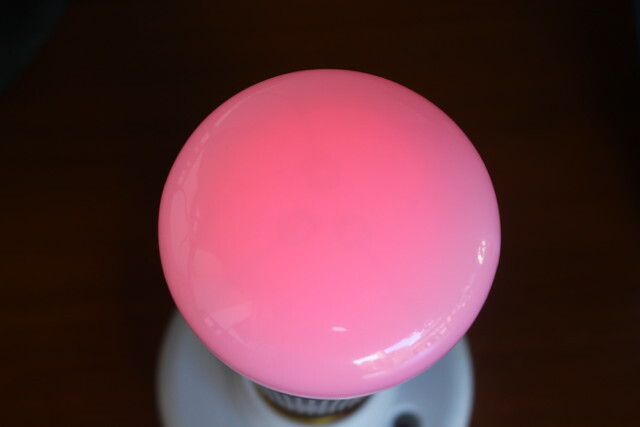 It also mentions the light bulb can be controlled with Amazon Alexa and Google Assistant / Nest. 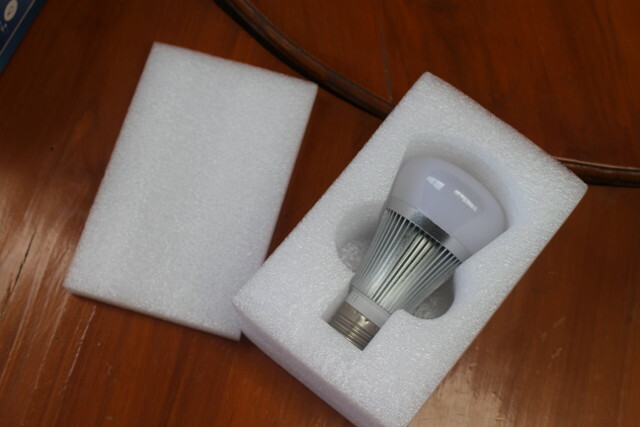 The light bulb is securely packed in a polyethylene foam, and is highly unlikely to break during transport. A user manual in Chinese & English is included together with a “Quality Control Passed” card. I’ve already reviewed Sonoff TH16 switch with eWelink App, and Sonoff B1 works the same way. Download the app for Android, or iOS, register an account, and click the + icon to add a new device. 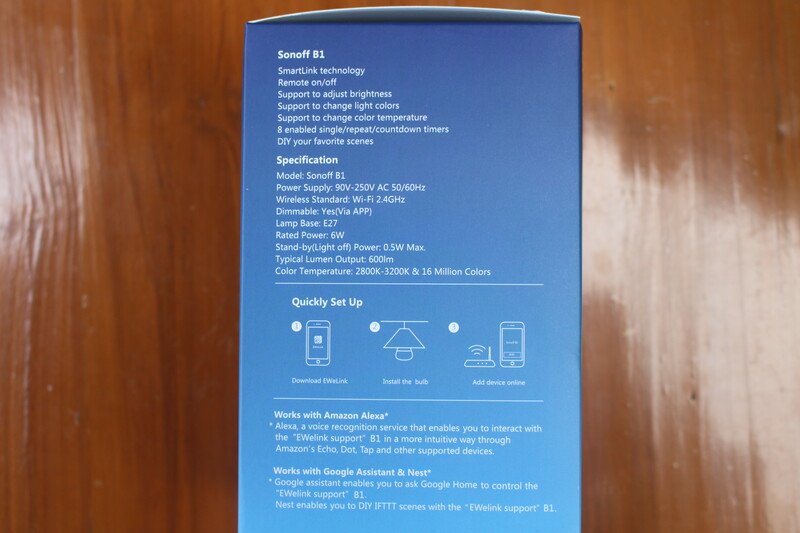 Sonoff B1 must then be put into pairing mode, but turn it off and on, three times, after switch it could blink and dim regularly. Click next, connect to your router, and you should be done. I’ve shot a short demo in the video below. 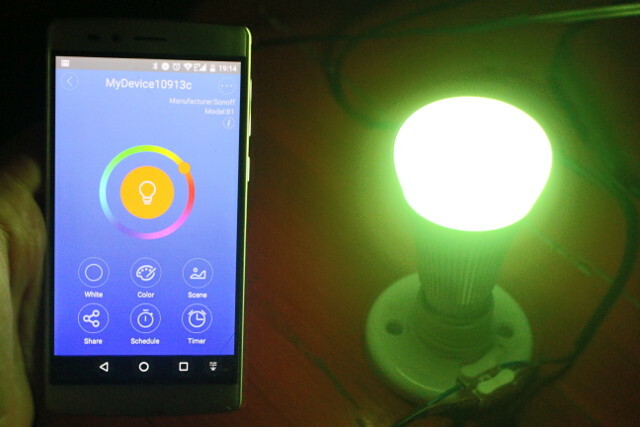 Once in the app you can control the white light with warm to cold, and brightness settings… If you’ve watched the video above, you’ll have noticed a 1+ second delay between the selected value in the app, and the actual change in the light, so the app must use the cloud instead of direct access to the home network. and the RGB lights with a color wheels. The white lights are quite brighter, but not bright enough to light up a room. It’s more suited as a bed light for reading, or outdoor for a romantic atmosphere like you;d get in bars or restaurants, similar – yet brighter – than candles lights. RGB lights are not bright at all. The photo above has been taken at night, and you’ll also notice the color selected on the phone does not also quite match the color set in the app, as I was expected an Orange light, but I got some pale green light instead. It also quite difficult to select specific colors with the wheel, as I could only get variation of pink when wanted to get a red light. The only way I found was to switch between White and Color menus, and it will automatically set it to red. 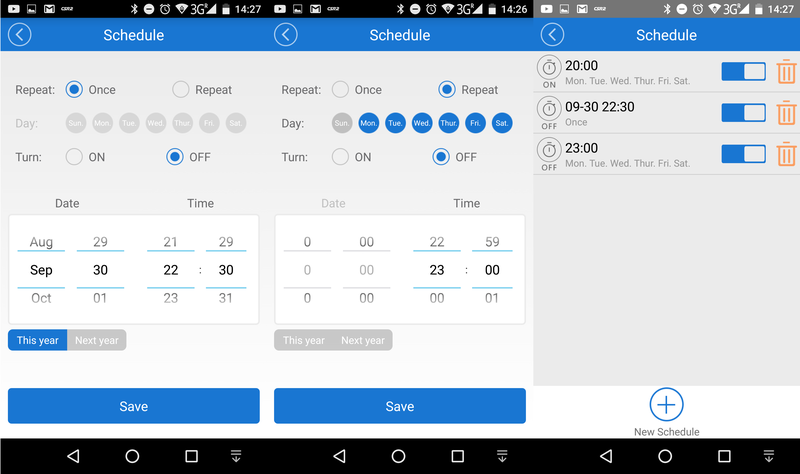 … and schedules that can be setup once, or repeated on any given day of the week. 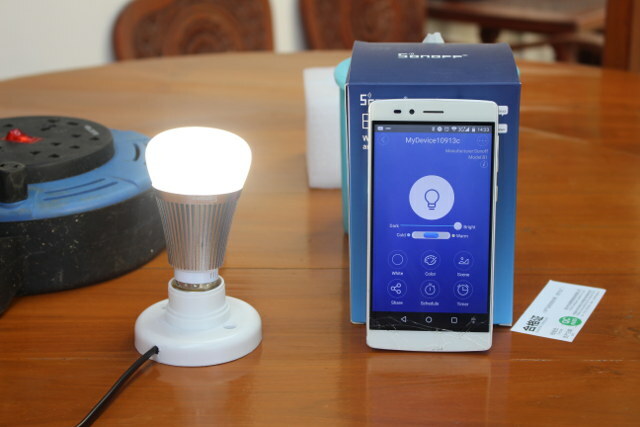 The share function is use to also another phone to control the light. 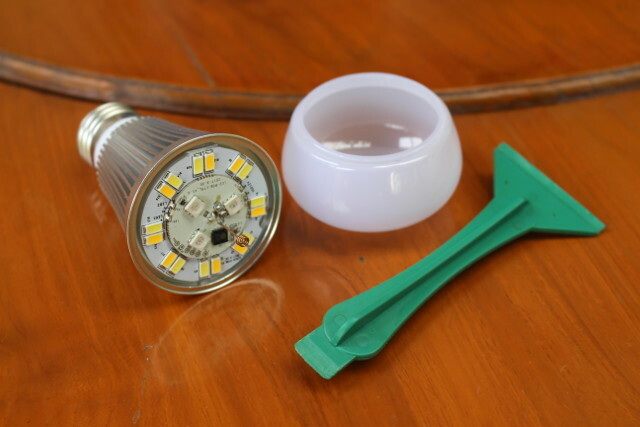 I could not take out of the bulb with my bare hands, so I used a rigid plastic tool, and it came off easily. 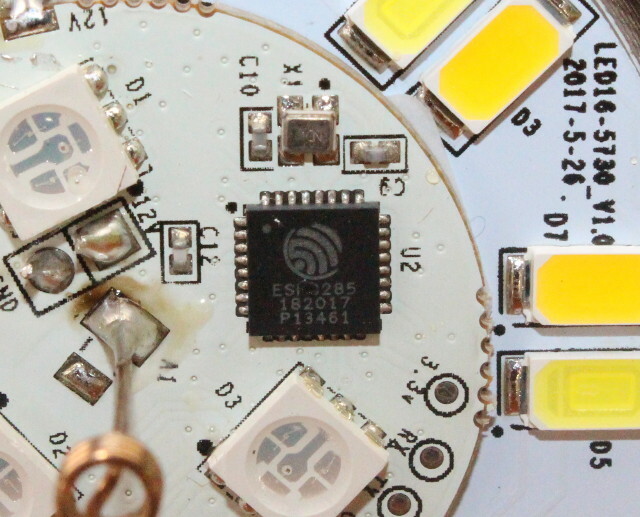 A close up on the board reveals 3 RGB LEDs and the antenna in the middle that explains why we have three dots in RGB mode. There are also two pairs of eight white LEDs respectively used for warm or cold whites. We can see GND, Tx, Rx, and 3.3V that can be used to upgrade firmware, as well as GPIO0 and SDA pin in the top right of the inner circle PCB. A close up on the board shows the circuit is controlled by Espressif ESP8285 SoC. We can also loosen the top and bottom of the “heatsink” part to access the power supply that’s protected with some black plastic cover. The plastic does not come out easily, so instead I cut it out to expose the pin, inserted the wire back, added some solder, and finally some hot glue to cover the joint. 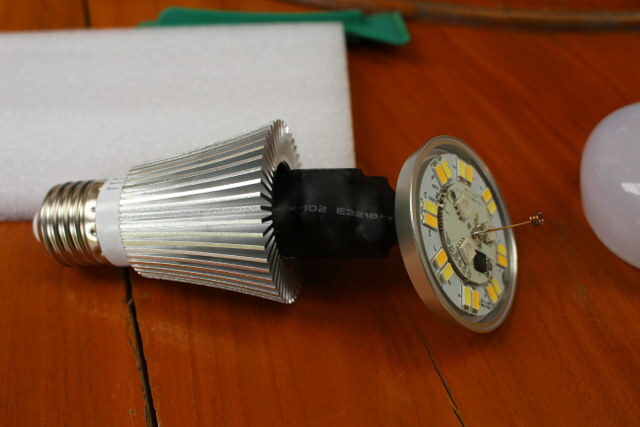 The 6W LED does not get hot at all, so it should not be a problem. It worked again, and I took a picture of the lamp without the three RGB LEDs set to red. I’d like to thank ITEAD Studio for sending a review sample. 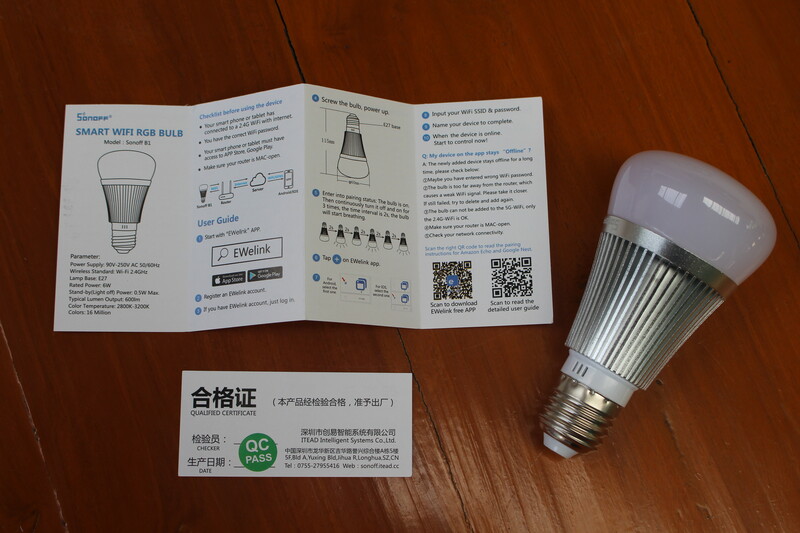 If you are interested, you can purchase the light bulb directly from them for $18 plus shipping, but it is also available on sites like Amazon US or Banggood. As mentioned in the introduction, the next step will be to flash an open source firmware. 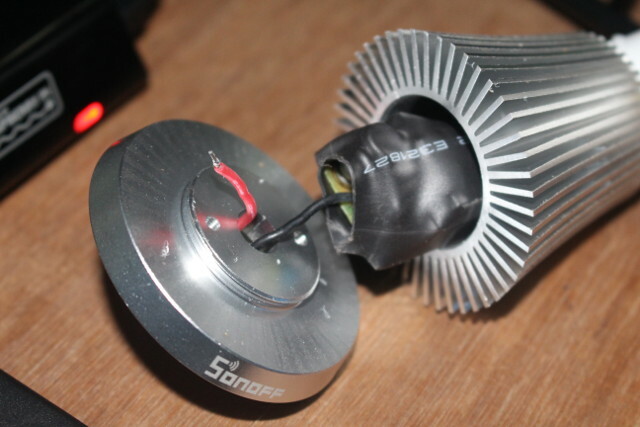 So far, I’ve been using ESPurna, but the developer has already published a review of Sonoff B1 with ESPurna, so this time around, I’ll give a try with Sonoff-Tasmota that also supports Sonoff B1. typo, should be ‘would look good on a store’s shelves’ I think? 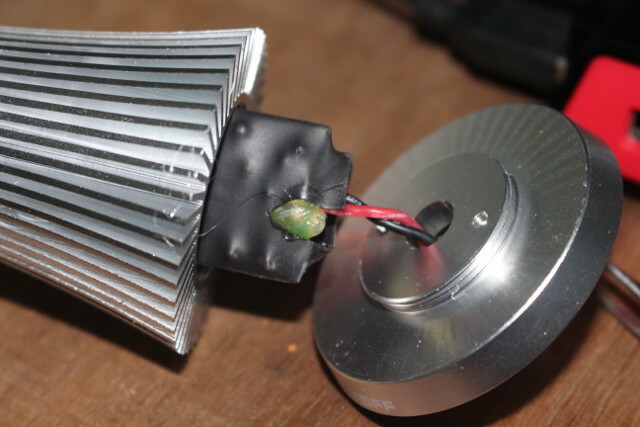 I had exactly the same problem with the red 12v wire coming loose. Mine clearly had a dry solder joint. I fixed that, but the board is still not receiving any power. 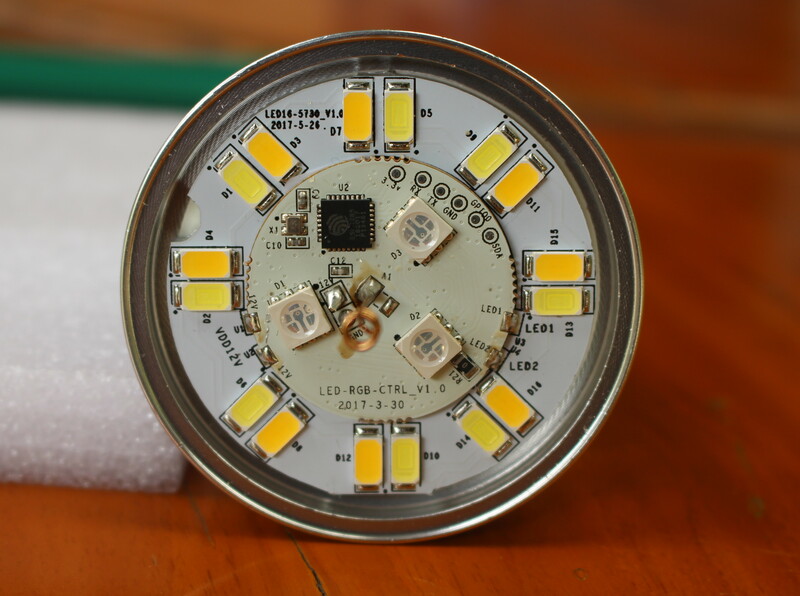 If I put 3.3v onto the board I can connect to the bulb via wifi, so the board still works.